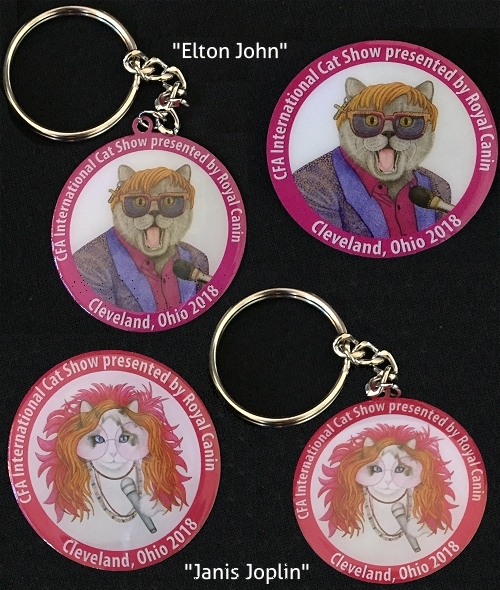 Get your 2018 Commemorative pins and keychains for the International Cat Show now! Order an individual pin or keychain in either design for $10.00 each. Both pin and keychain are 2" in size. Shipping for inside the U.S. is $4.00 for up to 4 items. Shipping for outside the U.S is $15.00 for up to 4 items. Note: If you are ordering more than 1 item, please add the FIRST item using one of the top 2 buttons (that includes the shipping charge). Then add more items to your cart using the bottom button for ADDITIONAL items (to avoid additional shipping charges).